Excerpt from the Shades of Milk and Honey audio book. 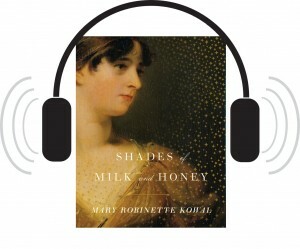 Shades of Milk and Honey is available through Audible.com as a digital download. Since they knew I narrated audio books, MacMillan asked me if I would be interested in recording my own book. Yes, very much so. Here is an excerpt from the Shades of Milk and Honey audio book. 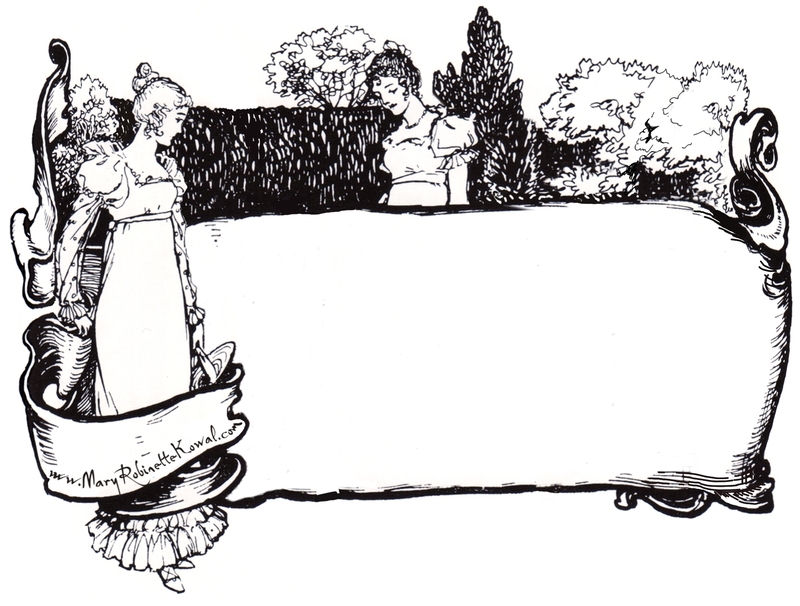 Take Jane Austen’s Pride and Prejudice and add a dash of magic and you have this delightful story by Mary Kowal. This is the story of two sisters, Jane, who is more magically talented, and Melody, a stunning beauty, and their quest to find love and stability. 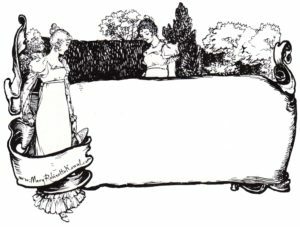 Both girls hope to marry well despite their lack of inheritance, and are pursued by various suitors. They are quickly embroiled into the intricacies of their neighbors’ lives, and the resulting series of events is sure to entrance the reader. For those who love reading Jane Austen’s books, this will at least temporarily satisfy the craving. A touch of magic inserted into the story is enough to enhance, but not overwhelm the story line. A quick, light read, with characters that the reader will feel right at home with. The item on today’s schedule to which I wish to draw your attention is the Shades of Milk and Honey launch tonight. A week from today, August 11th at 7 pm, I’ll be reading and signing books at Powell’s Cedar Hills Crossing store in Beaverton. Please come! 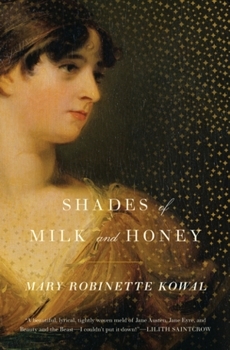 But if you can’t and want a signed copy of the book, you can order a signed copy of Shades of Milk and Honey Signed Edition from Powell’s Books. Today Shades of Milk and Honey is officially a published novel. I have to say that sitting here in my bathrobe with a cat curled up in my lap today does not feel externally different from yesterday. There are no fireworks going off outside. And yet… I’m aware that I’ve published a novel. That sentence alone makes my head boggle. Which really is a little absurd when you consider that I’ve been building up to this with short fiction for quite a while now. And yet… I’ve published a novel. Right now, my novel is sitting in a bookstore . It’s available in libraries. People can listen to it in audio. Or download it as an ebook. It’s hard to wrap my head around all of that even though I also understand and expect it. It’s the difference between my internal map and and my external map and it will take me a few days to align them. I suppose one of the reasons that this takes alignment is that I still think of myself as primarily a puppeteer. That’s been my job for the last twenty years. But gradually, writing has been shifting to become my dominant art form. Publishing a novel is a pretty clear marker, you know? Late tonight I’ll get on a plane to go to North Carolina for NasFic and when my seatmate asks the inevitable, “What do you do?” I think I might have a new answer. I just picked up my Nook and discovered that the ebook of Shades of Milk and Honey had downloaded to it. I believe this means that release day has arrived on the East Coast. I’m subscribed to the Tor/Forge newsletter because there have been some nifty giveaways and interviews in there. The funny thing here is that I forgot that I gave them an article for the newsletter and so was surprised to see my name today even though I knew darn well to expect it because my novel comes out tomorrow. When one decides to write a historical novel, even if it is a fantasy, one must brace oneself for copious amounts of research. Research which feels as though it will never end. The curious thing about all this research is that much of it does not show up on the page. While writing Shades of Milk and Honey, set in an alternate England in 1814 I learned a number of things which surprised me. Here are a few my favorites. What it means when a letter was crossed. There is no such thing as a left shoe. How to turn the table. Hello is not a word. 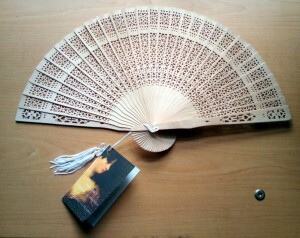 There’s more information about the novel and the people behind the traler at http://www.ShadesOfMilkAndHoney.com/trailer. I will shamelessly ask that you pass that link around to anyone that you think might like it. Meanwhile, I thought you might like to know a little about how the trailer is made. We’re using a style of puppetry called Shadow Masks. The style was originated by Larry Reed of Shadowlight in San Fransisco and it combines the grace of a human performer with the stylization of shadow puppetry. All of the set pieces are created with small cut paper vignettes on an overhead projector, while the performers work next to a paper screen with the masks. So when the Lady (Sarah Frechette) is sitting at the fortepiano, that’s a practical bench and a shadow fortepiano. Sarah is a puppeteer by trade but we also had two members of the Oregon Regency Society in to play the seamstress (Suzannah Hamlin) and the gentleman (Jason Stanley). They do a wonderful job and I wish you could see some of shots we didn’t use, which really show off their beautiful sense of movement. The magic, which in the world of the novel is called glamour, is CG and created by Remo Balcells, a BAFTA award winning special effects supervisor, and his assistant Johnathan Nation. Cory Doctorow at BoingBoing, says very nice things! 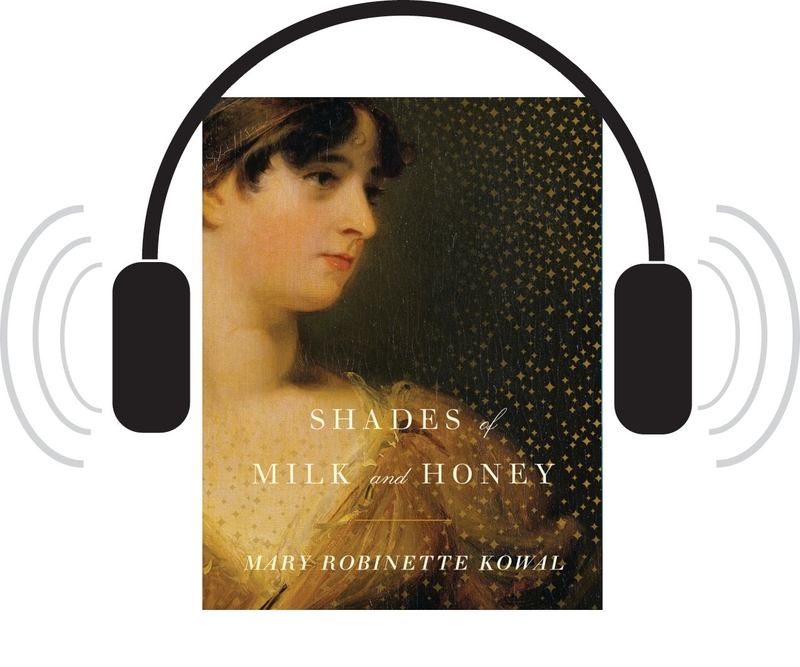 Shades of Milk and Honey is the hotly anticipated debut novel from Mary Robinette Kowal, who has already made a name for herself in science fiction with a series out outstanding short stories. It’s a Regency drawing-room romance, told in pitch-perfect style, with one important difference: these mannered and well-bred nobles are able to do magic. By conjuring “folds from the ether,” well-brought-up men and women are able to create optical illusions — or even breezes and smells — though such workings are quite exhausting and too much conjuring can leave the practicioner comatose, brain-damaged or dead. 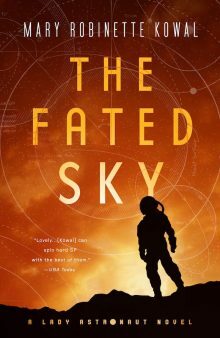 You can read the whole review at Shades of Milk and Honey: Kowal’s debut novel is a drawing-room romance with magic and art – Boing Boing. I went over to Miss V–‘s for the second fitting of the spencer. The photo does not do it justice but wait until you see the finished garment. For this fitting, she wanted to confirm that everything had lined up before she stitched together the lining and the exterior. Since she had trued the garment, it was always possible that things had shifted. Indeed, we had to make adjustments to the sleeves to account for the fact that one arm is slightly longer than the other. This, by the way, is entirely normal. Check it out. Put your elbows on the table in front of you and press your arms together with palms touching. Now look at your finger tips. Chances are that the tips of your dominant fingers will be slightly longer than your off-hand. The other point of conversation that was interesting was on how to handle the closure on the spencer. Buttons or hooks-and-eyes were both in use in 1814 and it wasn’t clear, looking at reference material, which one would be more likely for a double-breasted spencer like this. Even garments that look buttoned may have decorative buttons and a hook and eye closure. 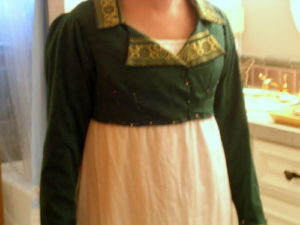 I think we finally settled on self-covered buttons of the same green as the rest of the spencer. I’ll have it on Tuesday — for Shades of Milk and Honey‘s book release day! One of the useful side effects of having a caffeine intolerance is that it doesn’t take very much to help me with pulling an all-nighter. As you might guess, Rob and I wound up staying up through the night to finish the trailer for Shades of Milk and Honey. He’s going to be at the winery all week and the studio wasn’t available today. So… it was do or die. Through a variety of circumstance ranging from corrupted uploads to paying work coming in, which always supersedes a freebie, to export errors we’d cut it really close. Still, we had no expectation when we went down there that we’d stay up all night. We left around 9:20 this morning and my writers group meets not far from the editing suite, so I’ve arrived about forty-five minutes early to have coffee and breakfast. I ordered a half-caff latte. Shocking, I know. It really is silly that it sounds like a total wimpy beverage and will in fact leave me a little wired. I have no complaints about this. The bike ride also helped, but I’m going straight home and to bed. The fellow who is doing the special effects for the Shades of Milk and Honey book trailer is a BAFTA award winning special effects supervisor who I know from Lazytown. Remo Balcells has worked on films like The Fifth Element and Final Fantasy. He’s currently doing FX for Hawaii Five-0. You know… I didn’t think there was a profession out there that made puppetry phrases look completely prosaic. “Quacking off?” I have no idea what it means, but it sounds fantastic. Can you spot Shades of Milk and Honey in the wild? I’ve just received word that Shades of Milk and Honey is turning up in some bookstores already. The official release date isn’t until next Tuesday. August 3rd. Five days. But since they’ve shipped, some bookstores go ahead and stock them as soon as the box arrives. Not that I’m eager to see it or anything, but… I will mail a hand fan and a signed book plate to the the first five people who spot the novel in the wild. Just capture it with a camera, post the picture online via your electronic means of choice then come back to my website and drop the link in the comment thread.